I am a huge fan of an upholstered bedhead as I feel that bedrooms, as places of sanctuary, should be cosy, soft and inviting. A beautifully finished bedhead makes a colour and sometimes a major design statement, is tactile and really nice to rest upon after a long day. I have some tips below to help you to find and select exactly the right style for you. 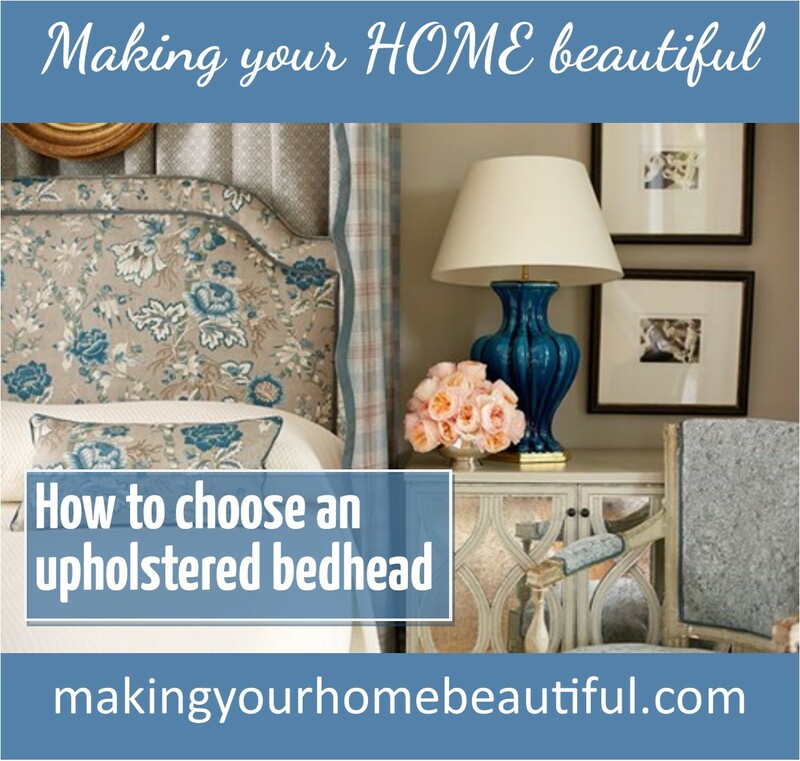 Which upholstered bedhead do you need for your style? Firstly, consider the style of your decorating. Is your look more contemporary or modern with a retro feel? 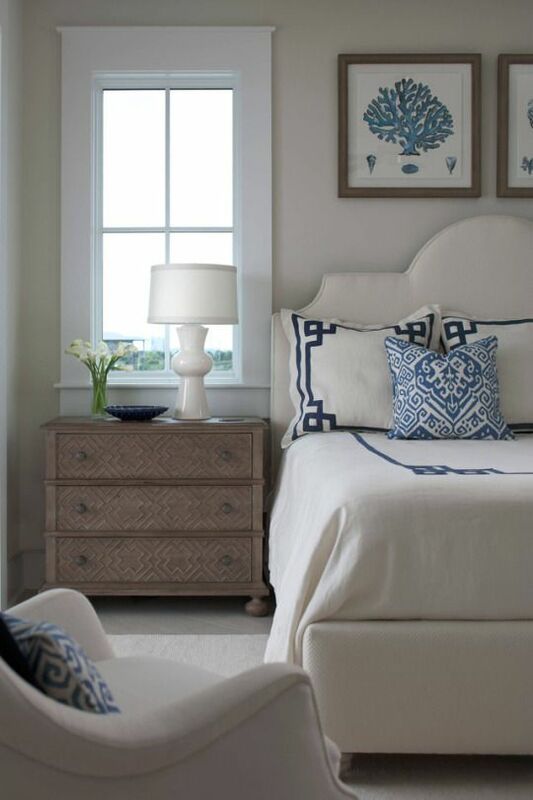 Are you more of a fan of the Hamptons style of decorating or do you just like a simple classic timeless feel? 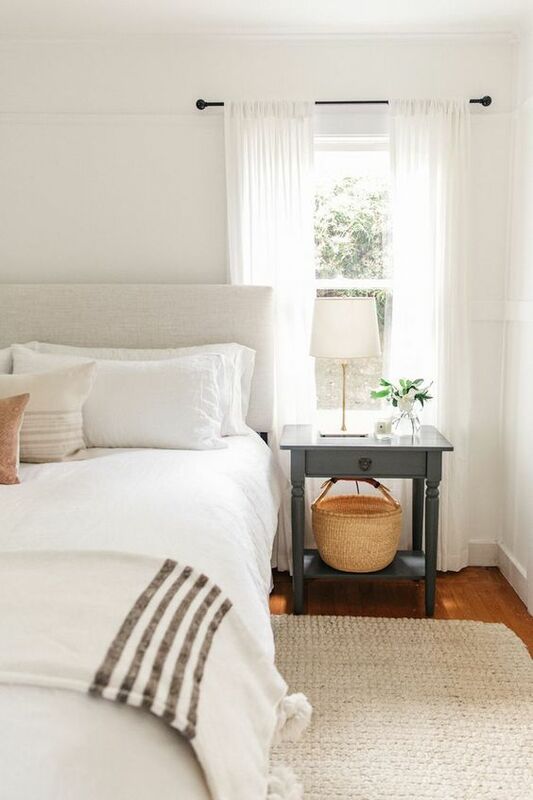 The image above of a neutral bedroom with neutral plain fabric on the bedhead demonstrates the classic look really well. 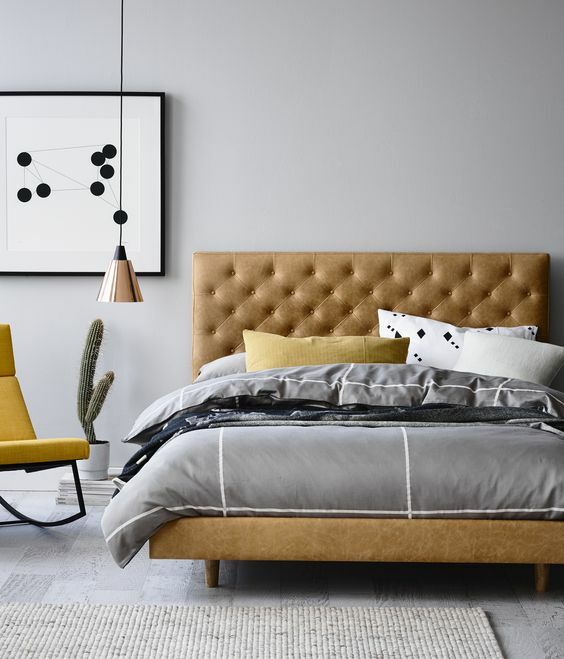 If you prefer a contemporary style then you should opt for a bedhead with clean lines, upholstered in a plain fabric and possibly finished on the edge with a timber veneer or polyurethane painted finish. The image below is upholstered in a simple duck egg blue linen fabric which gives you a clean contemporary look. This can be either dressed up or down depending upon the accessories you use. Alternatively if you like the contemporary style but with a Retro twist then you might like a design that is square edged and simple but with some vertical lines. 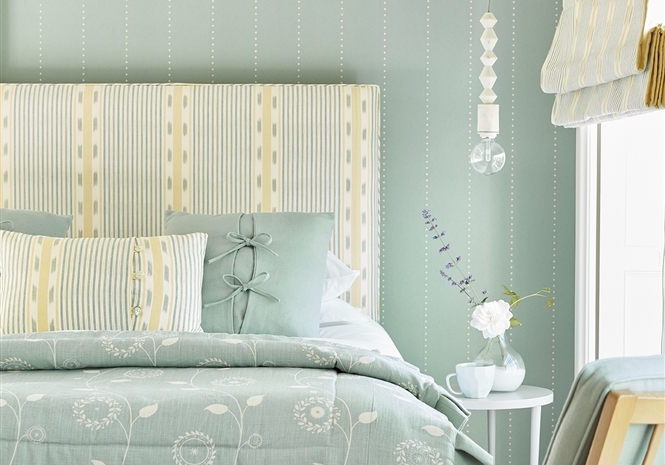 Finished in a green velvet and extended past the edges of the bed, the bedhead below really adds to the retro touch. A classic style bedhead will usually have a little bit more of a design element with perhaps a scalloped edge or side panels. These styles are very elegant and timeless and offer slightly more than a simple square edged bedhead but are not as fussy as those with a buttoned finish. Again they can be dressed up or down depending upon the style of fabric and the other accessories. If you like the classic look but want a little bit more of a design then this scalloped edge behead below would be perfect. 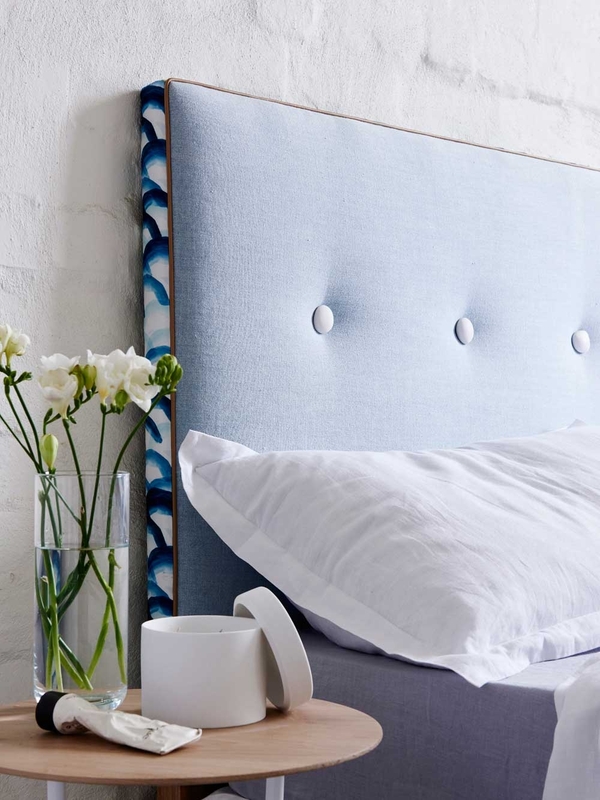 A traditional style upholstered bedhead will have the button detail included in the design. 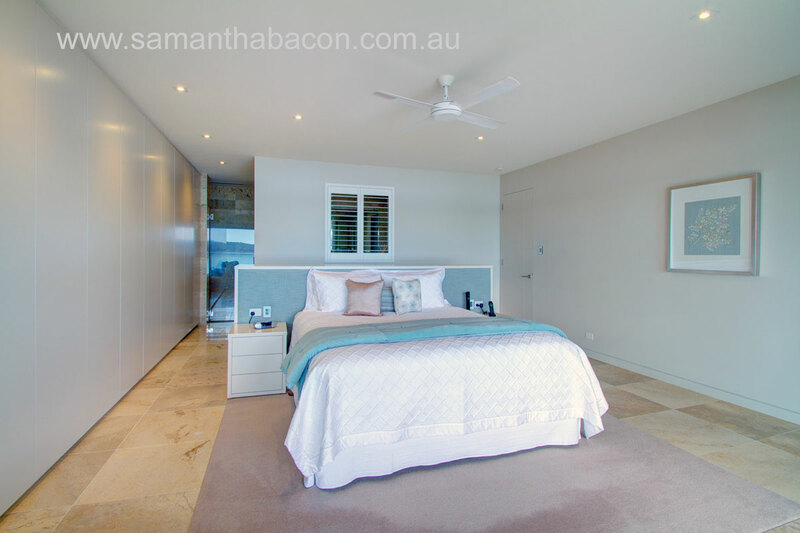 These pieces, although traditional, are timeless and I have seen them used successfully in more contemporary schemes, particularly if the house is heritage listed but is being decorated in a modern way. 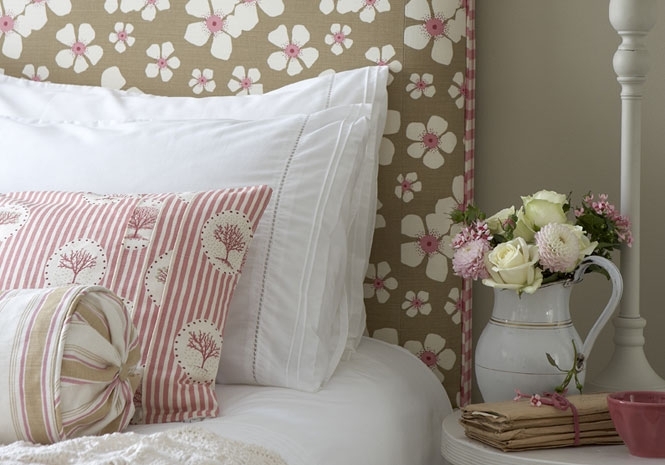 A pretty country style look can be achieved with a design that is co-ordinated with the bedding and wallpaper. Fabric houses will have ranges that all go together and this can be a very simple way to achieve a great look that naturally works. 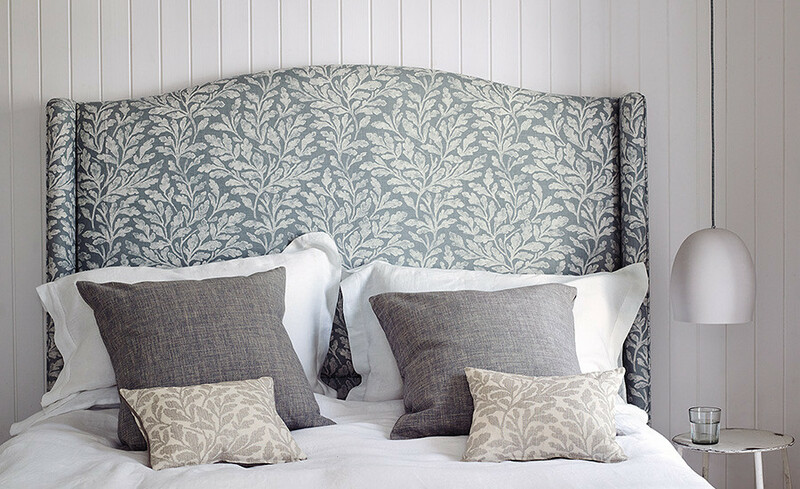 These two patterned upholstered bedheads suit an English country style look. So the shape and how the bedhead is finished is really important to consider to ensure that you select one that suits your style. Don’t forget the smaller elements like statement co-ordinated fabric on the edges, buttons, piping and studs. These small accents can make the piece very special and will differentiate them from off-the-shelft bedheads. 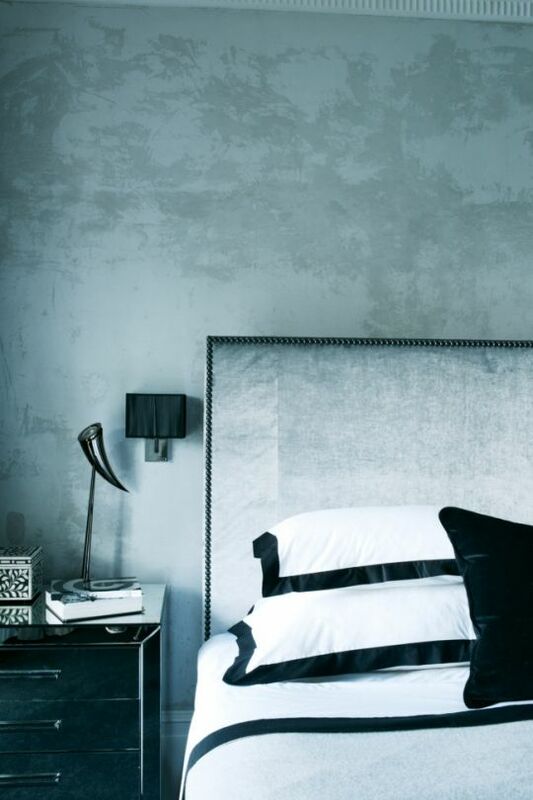 The designer in the image below has cleverly tied the studs from the bedhead into the artwork. Just a simple finishing touch, but it makes a big difference. In addition to the shape, you can also change the look and the style with the type of fabric that you choose. 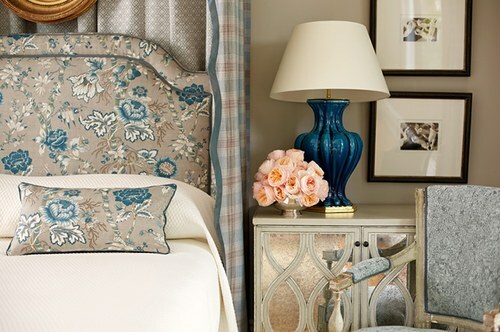 A stunning floral design makes a fabulous statement. 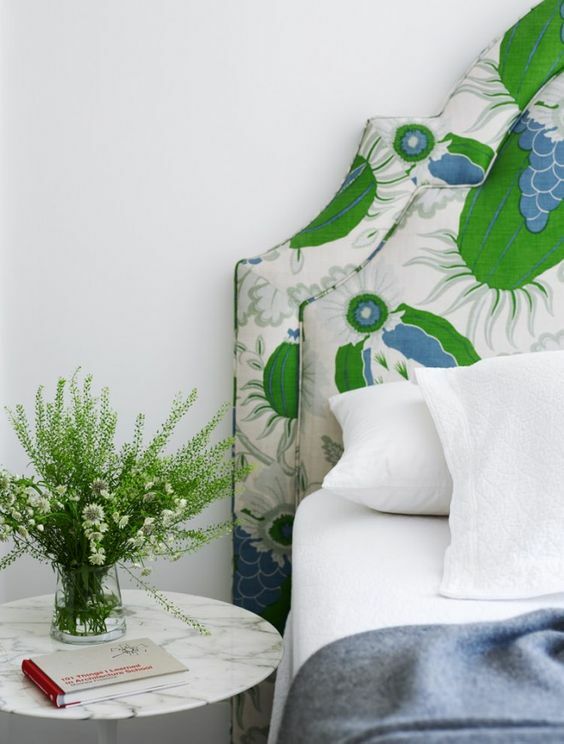 This fabric is fresh and uplifting and sets the tone for the room. A rich velvet will give you a glamorous and opulent feel while a simple linen will give you a timeless look, regardless of the style. 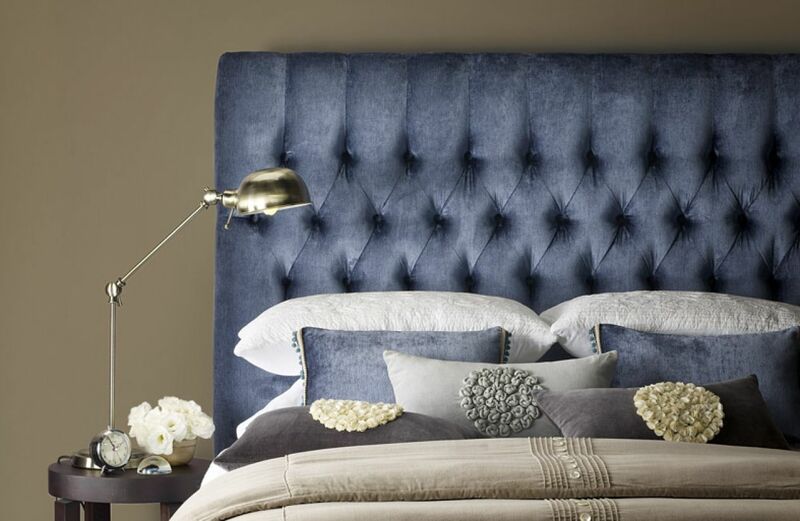 Bedheads can also be upholstered in leather for a masculine contemporary touch. A note of practicality here though when we are discussing fabrics. Some fabric will be more durable than others and whichever one you get you should ensure that you protect it with Scotchguard or a similar product. Some fabrics are pre-treated to resist stains while some velvets do not mark or crush. Bear these points in mind when selecting a fabric and read my post below for more information. Lastly, colour will play an important role in determining the look and style. 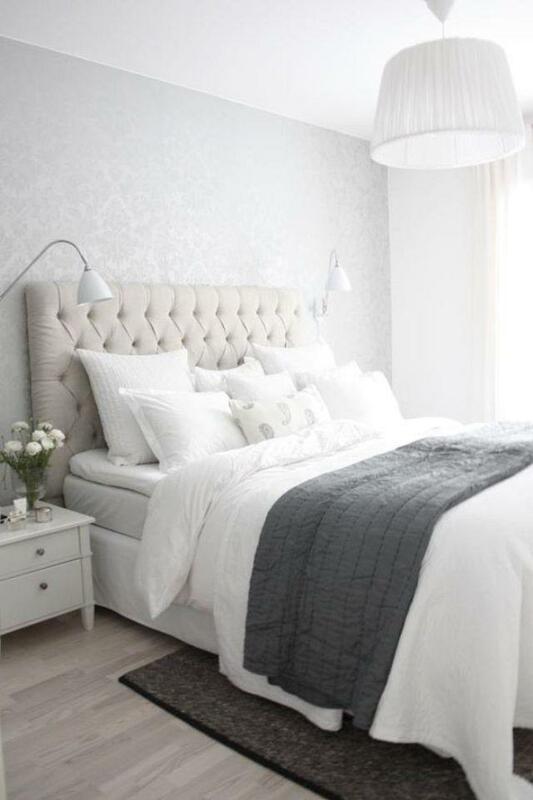 An upholstered bedhead can really become a feature in a bedroom so in addition to considering the style and type of fabric you also need to consider the colour. A natural linen hue or a simple dark charcoal is timeless and will work with many different colour schemes and the great feature of this is that although beautiful it will not necessarily dictate the rest of the room. Nor will you easily tire of it and it won’t date. 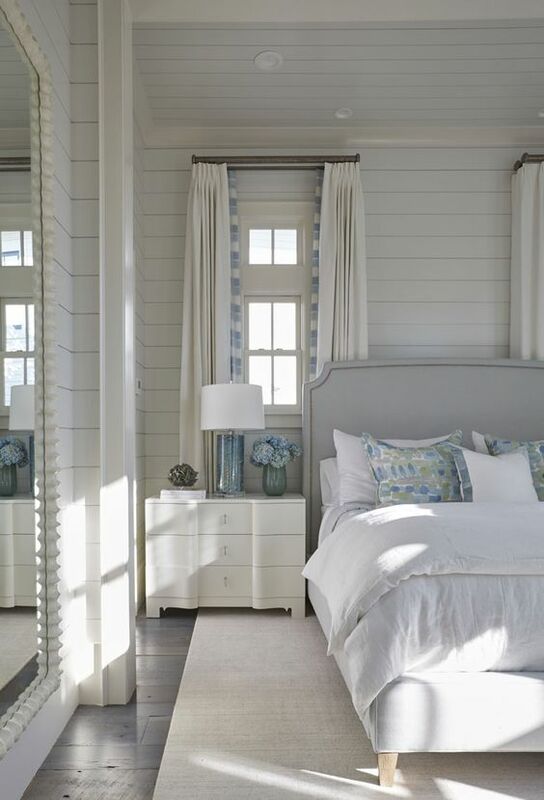 A soft linen, pale grey or pale blue fabric gives you more of a Hamptons style. If you prefer to have more of a contrast then you could consider this colour scheme in the image below which is one of my favourites. Still neutral but with a touch of calming blue. 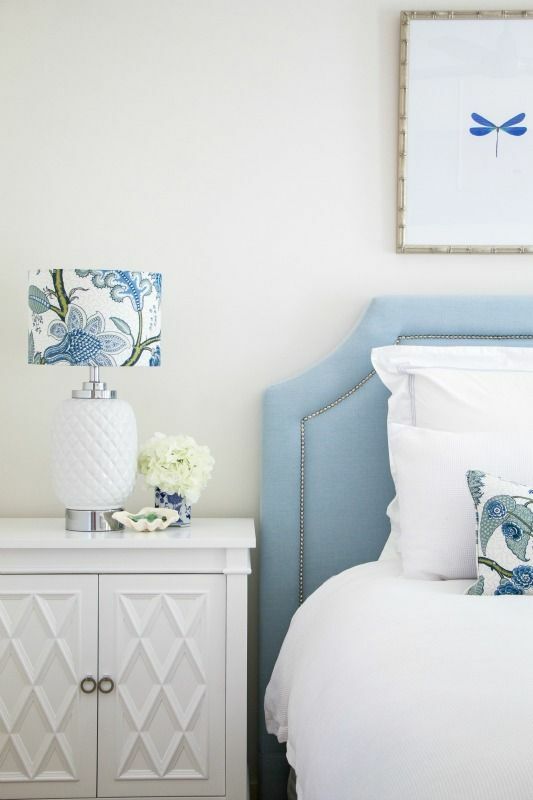 I really love neutrals in a bedroom with blue accents and this upholstered bedhead is a great feature in the room. 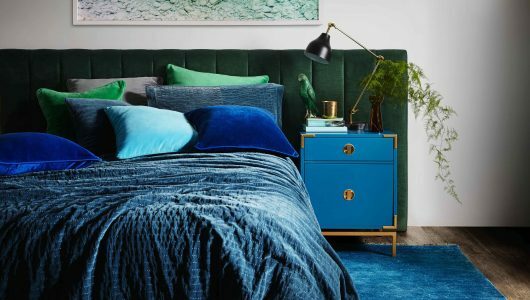 A full on block of feature colour can make a great statement, particularly if you make the bedhead over-sized, and then use this as your starting point for the other items in your scheme. The beauty with upholstered bedheads is that if you select a very simple style, you can easily re-upholster it yourself or if you have a more intricate style you can have this re-upholstered by a professional and still have a new look for relatively little cost. 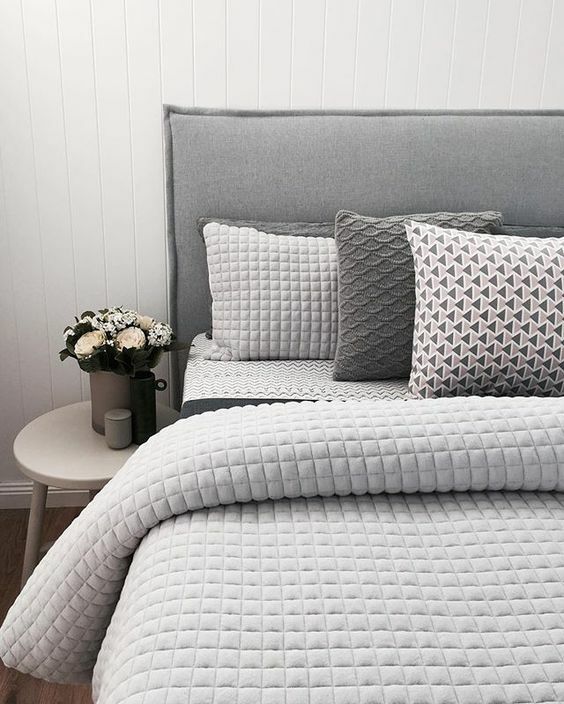 I have lots of inspiration on my Instagram and Pinterest accounts including a board of bedroom favourites that you might like to visit and I would love to hear your comments in the section below.